Have any old newspapers laying around the house? Rather than toss them out, we love using them for arts and craft projects. The lightweight texture of newspaper makes it a perfect base for painting, curling and crinkling and the mixed media look always yields beautiful art projects. 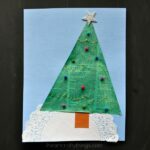 Here are some amazing Christmas newspaper craft ideas that are sure to delight kids of all ages and even adults. 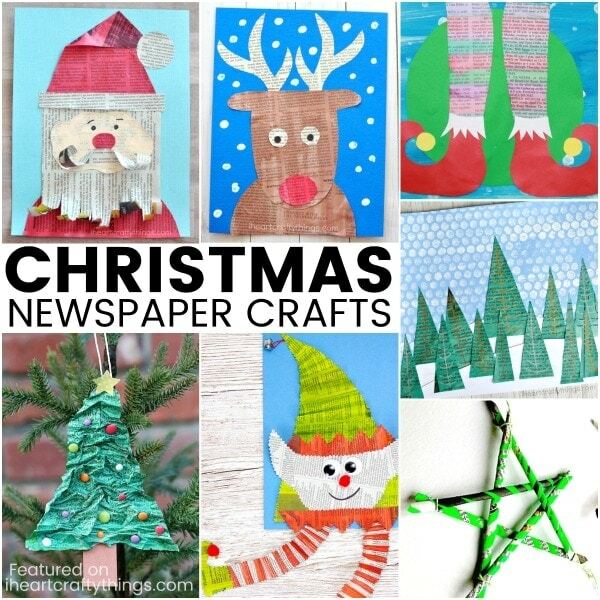 Go grab some newsprint and get ready for an afternoon full of fun with these creative Christmas newspaper craft ideas. Click on the title links underneath the photo collages to be taken to the full Christmas newspaper craft ideas tutorials. If you would like to share this post (please do!) we would appreciate if you would use the top square image for social shares or the vertical image at the bottom for pinning. 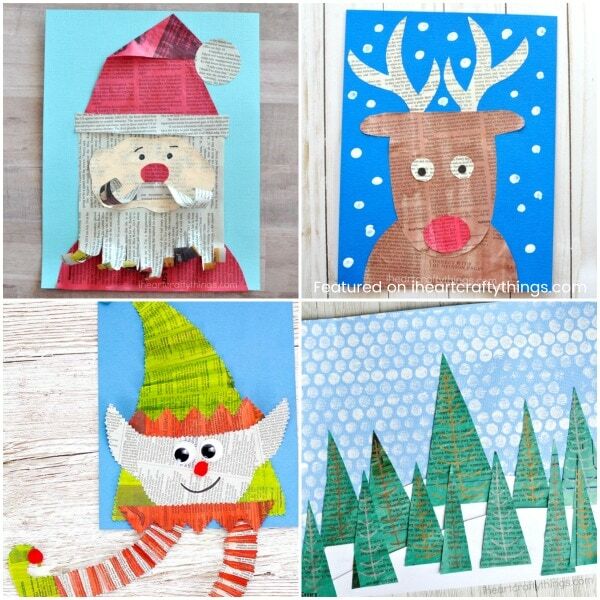 The texture of newsprint gives this newspaper Santa craft a fun vintage look. You can cut out the pieces on your own for a unique looking Santa or purchase a pattern in our TPT store for easy prep. Rudolph the Red-nosed Reindeer is a favorite Christmas character for children. 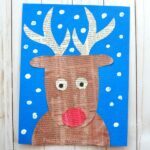 Paint newspaper with brown watercolors to create this lovely reindeer craft. Could this newspaper elf get any cuter? The springy legs makes this adorable newspaper elf craft so much fun for kids! Combine different shapes of newspaper triangles with a bubble printed snowy background to create a gorgeous wintery forest art project. Newspaper once again is a perfect base for this mixed media elf shoes craft. Kids will love getting creative by choosing which colors to paint their elf tights. This crinkly Christmas tree ornament made from newspaper is darling! 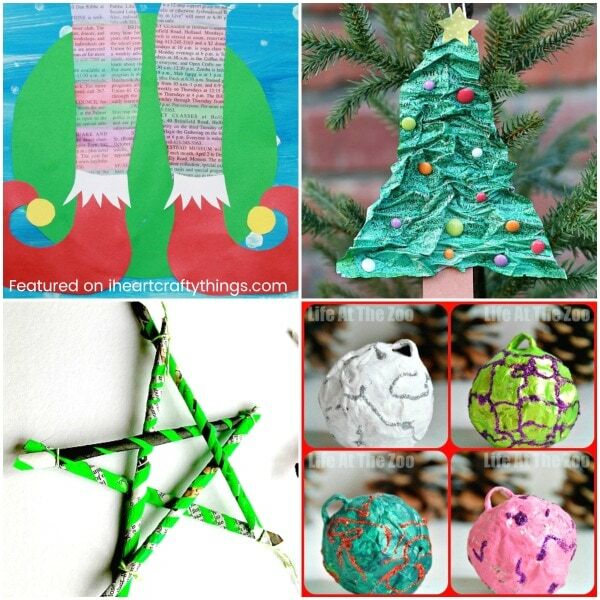 Such a great way for kids to create a recyclable Christmas ornament. Create paper straws from newspaper and then use them to make a beautiful Christmas star ornament. The added bright paint makes this cute star ornament really stand out. Paper Mache was a favorite for me when I was a kid. Here is a fun way to use the technique with newspaper to create colorful Christmas tree baubles. More fun with newspaper paper straws! I love how these pretty Christmas trees can be made as a Christmas card or a simple Christmas tree ornament. A simple painted newspaper triangle is all you need to create this simple and darling newspaper Christmas tree craft. This one is great for preschoolers! 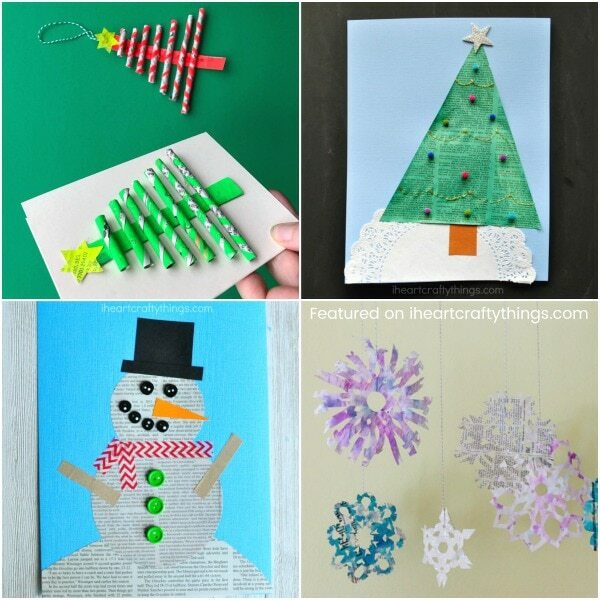 Take a break from Christmas crafts to celebrate the winter season with more fun newspaper craft ideas. This newspaper snowman craft is super simple to make and kids can customize it with any embellishments you have laying around the house like buttons, washi tape or sequins. These painted newspaper snowflakes would make a beautiful decoration hung from the ceiling at home or school. Add some glitter for extra sparkle! 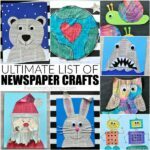 Looking for more fun newspaper craft ideas? 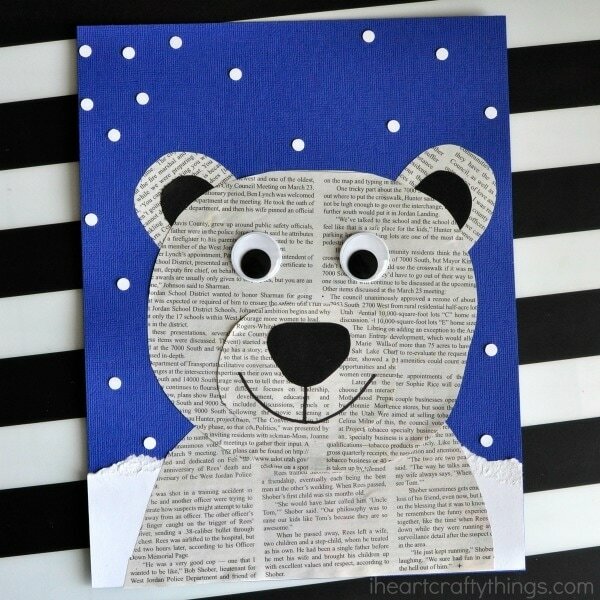 This newspaper polar bear craft is beautiful and perfect for a winter craft. This newspaper birch tree winter art project is another favorite!